'We Are Not Valued': Brazil's Domestic Workers Seek Rights : Parallels Brazil has more household workers per capita than any other country. A new law in the South American nation expanded the rights of domestic workers. But despite the law being on the books now for almost two months, there is still a long way to go in changing the social dynamic in Brazil. 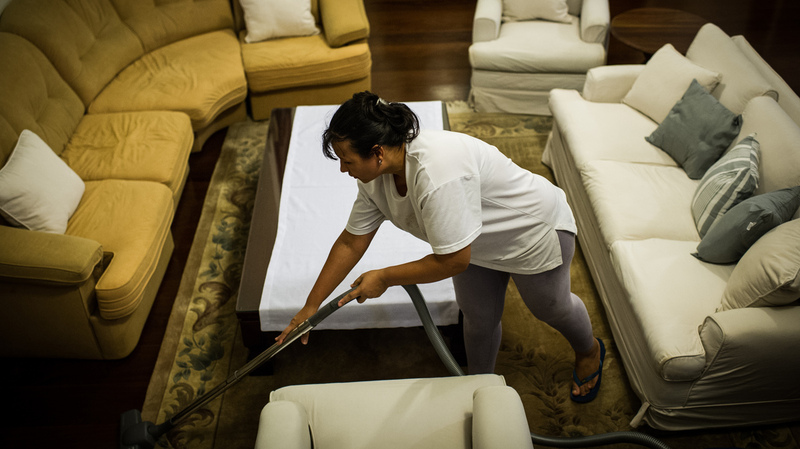 Cassia Mendes, who has worked as a housekeeper for more than 20 years, cleans a house in Sao Paulo, Brazil, on Feb. 19, 2012. Brazil enacted on April 2 a constitutional amendment to grant domestic workers health insurance and other benefits. Eliana Gomes Menezes, the director of Domestica, a union representing household workers, says the new law gives domestic workers a working week of 44 hours, grants pay for overtime, gives an hour off for lunch and allows for a month of paid vacation a year plus maternity benefits. In addition, an employer has to contribute to his employee's social security. Domestic staff have been flooding into the office to try and get informed on what the new law entails. "But our victory is not the end, it's only the beginning," Gomes Menezes says. "We have to make that law have value. It's a question of social justice." In fact, despite the law being on the books now for almost two months, most domestic workers are still paid under the table. About 70 percent still haven't registered to legalize their status. Advocates say one reasons is fear — it's not hard to see why. Vilma Souza is among those in the waiting room of the Domestic Workers Union. Like most women here, she's black and from Brazil's poorer north. She tells her former employer on the phone that she's waiting for him. It's a long discussion, but one that goes nowhere. She says she's been trying to get her employer to pay her what he owes her. Although the law is on her side, he's refusing to see her. "The union person has shown me my rights and how much my employer owes me, but still refusing to pay me," she says. "I did everything: wash, clean, iron, cook. There is huge inequality here. We are not valued." Souza says she is treated like an insignificant person, and that her employers think just she works in their house because she is incapable of doing something else. "They don't understand it's a job worthy of respect like any other," she says. Nearby is Valdemira da Silva. She also came to the union to find out about her rights under the new law. She says she was hired to take care of one child, and now she says a third is on its way. "They fired the person who used to come to iron clothes and the cleaner, and I'm doing all the work in the house," da Silva says. "They push a bit more everyday, and now I have no time to even sit and eat." She says she gets paid about $500 a month; there are no fixed hours. She leaves whenever her employers come home. She says she wants to be registered and get her rights, but is afraid how her employers will react. The plight of domestic servants is the subject of a new documentary called simply Domesticas, or housemaids. The film's director, Gabriel Mascaro, gave a series of cameras to middle class teenage film students and told them to film their maids at home for a week. Mascaro says he wanted to show the often-complex relationships between servants and the families they serve. They often live together, and there is affection, but also abuse. "It's a legacy of Brazilian slavery," Mascaro says. "Until now, society here didn't even consider domesticas as a working class. This new law tries to minimize the exploitation." But some observers say what will really change the dynamic here is not laws, but the opportunities that come with economic empowerment. William Eid, an economist at the Fundação Getulio Vargas, says employment is at record highs in Brazil and domestic workers have seen their options expand. "They [can] go into the service industry," Eid says. "Service is growing very fast in Brazil ... because most of the people who go to big cities go to work in the service industry. Not in the homes." Back at the union office, Vilma Souza agrees. She says she won't work as a cleaner anymore, and wants to fulfill her dream of becoming a baker — making cakes for the rich.